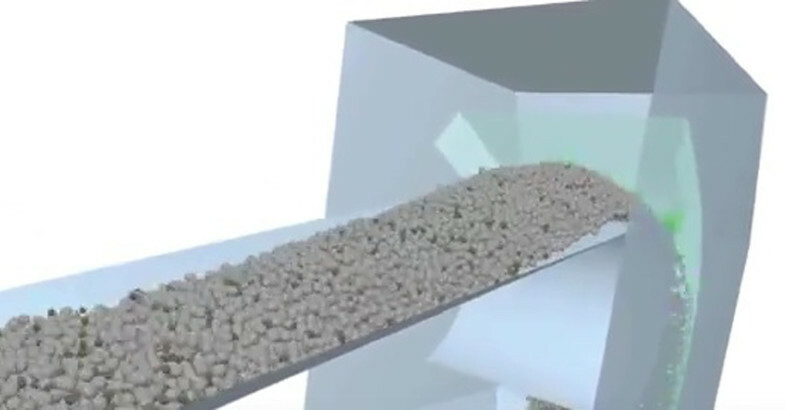 EDEM software is used to simulate the flow of bulk materials through a transfer chute. EDEM enables both qualitative and quantitative analysis of transfer chutes designs to explore design scenarios and verify performance. It provides engineers with the insight to make design decisions concerning a range of key areas including: * Prevention of plugging and spillage, *Identification of excessive material velocities and dispersed flow, *Ensuring appropriate delivery of material onto conveyor belts, *Optimization of wear protection. EDEM simulation and analysis enable engineers to make design decisions with confidence, throughout the design process, resulting in equipment that is better optimized to perform well, across the expected range of operating conditions.